Discussion in 'File Downloads - Share and Request' started by krHACKen, Dec 24, 2018. I've uploaded a new CoDec tool a few hours ago. Same download link. In other words, -cdvdmaninject was not working, and it is fixed now, and tested too. Nice. But it will be unusable if we don't have the HDD ID that it's bound to . Also, I believe that my DUMP_IDS tool is too old for running on PS3. The jurassic SBV patches and USB drivers may crash the emulator. Perhaps I need to code a new one. Nobody tried and reported that it's working in the PS3. My CECHA didn't seem to have problems running it. Not sure if this is how the HDD ID is supposed to look like, but it did work. Marvelous. So, if the tool didn't somehow fail at collecting the ID, the ID of the virtual HDD is always NULL. The emu just returns the SCEI magic so the HDD is reported genuine by the ATA device driver. I didn't expect that lol. So among all the stuff that were ever dumped, did you guys ever find any HDD with the firmware-level DRM activated? Since we're dealing with Sony software, it might be appropriate to note that the PS2 was not designed with modern 2.5" (2005+) HDDs in mind. I have been updating the homebrew PS2SDK to put the HDD in STANDBY state before the HDD unit is shut down (including when the power button is pressed), which is to avoid causing emergency parking by some HDDs. There doesn't seem to be a standard for this, but some manufacturers have recommended putting the HDD in STANDBY state before power is cut, as the method for parking the heads due to power loss is mechnically stressful. However, older software (including Sony software) will not be aware of this requirement by new 2.5" HDDs. This will explain the louder click sounds that you might get, when the HDD unit is shut down by older software. The DTL-T10000 itself will always do a hard reset, whenever the reset button is pushed or the reset command is issued. So it's quite unsuitable for working with such HDDs, but the 2.5" fit best in the SCPH-20400 enclosure. and USB drivers may crash the emulator. Specifically, it's USBD that mattered. There were some differences around, but I think it was caused by the logic for acknowledging interrupts being wrong (it did a logical OR of the bit to acknowledge with the mask itself, not just the bit to acknowledge). Somehow, it still worked on the PS2. AKuHAK, krHACKen and SILENT_Pavel like this. I might add, this was with Nobunaga's Ambition's title ID (SLPM_651.97). With POLViewer's title ID (SCUS_972.69) it freezes at launch, showing only black screen. I recently bought a fat PS2 with Network Adapter and an IDE HDD inside. I don't currently have any PS2 games and the thing doesn't seem to be modded for burned discs, so as it stands right now there's not much I can do with it, but if you are interested I guess I could dump the HDD if you are interested and tell me how it's done. AKuHAK and krHACKen like this. And who can put the installed Final Fantasy XI Online? Connect your HDD to your PC, via IDE or an IDE to USB adapter. Dump it with HDD Raw Copy Tool, as compressed image (.imgc). For dumping the i.Link ID, the PS2 sadly has to be able to run homebrews. Dumping the i.Link ID can be done with ID Dumper, or ps2Ident. For dumping the HDD ID, you need a console which can run homebrews too, except that it can be another console. The tool for dumping is the very same ID Dumper. So yeah, I'm still interested in having your HDD image. But without the IDs, I couldn't hack it to make it bootable. The missing i.Link ID can be forged from the console serial number + the console model number written on the sticker. But as far as I know, the missing piece of the puzzle, the HDD ID, cannot be calculated. - The PC+X360+PS2 Content ID was revoked, and a new one was created just for the PC version. - The online world gaming server for the PS2 version is dead. - The FFXI Online game update server for the PS2 version is dead. - There's no DNAS server to get the passphrase from, and DNASrep won't help with this. - Certs probably have expired. - The FFXI Online installation will be tied to the donor hardware IDs, and since no injection of the IDs is done to FFXI Online, it would fail to decrypt. In other words, you could probably install it (as well as Dirge of Cerberus and Front Mission Online), or share your original installation dump, but it'll not run. Waste of HDD space. That's why I haven't shared a dump with FFXI Online in it. I'm focussing to bootable stuff that can be preserved, for PS2 history's sake. i might still have the POL version before the "goodbye" version installed on my IBM/Sony hdd, but i cant provide any ID's as the console(SCPH-10000) is currently dead. I've used HHD RAW Copy Tool before and my motherboard still has an IDE port, and, also, my ISP just upgraded me to 10mbit upload, so, it shouldn't take an eternity to upload, hopefuly xD. Would I be given somewhere to upload, or should I find something myself? I don't remember how big the disk was, hopefuly very compressible, but I think it was a 160 GB'er. It was about a year ago I bought it and it's been in storage since after I tested and cleaned it and saw it wasn't modded already. I won't go dig the thing up until it's dumping time. By the way, it's a PAL model from Spain, and I have no idea what's inside the disk. Of course all of it make sense only if console has some interesting data on it. Anyway if you create compressed image with HDD RAW copy tool it will not take much space. The bigest compressed image i see was 7Gb in size. 160 GB and PAL model? Are you sure that you have genuine Sony HDD? That size HDD can be used only in PSX DESR units which are not PAL in any case. No no, as I said last time, I went to a second hand shop to look arround for interesting stuff and they had a number of pretty cheap fat PS2s. I noticed one had the broadband adapter attatched in the back so I picked that one, especially seeing it wasn't priced higher than those without it. So I do have the console, the BBA and a disk too. Not bad for 33 EUR, I suppose. I think the disk is 160GB, but I could also be wrong. I'll be sure when I dig the console up again. Probably not SONY branded, but I don't remember that. The problem is that the console is unmodified, so all I could do with it so far was clean it up, navigate the BIOS menus and store it away for later. Years, during a stock clearance sale, I bought two Memor32 cards for 50cents each (not bad ), because I remembered reading somewhere that they could be used in a softmod somehow and it seemed a good deal, but I don't know how it's done. I don't have much knowledge about the PS2 as I didn't have one back in the day, much less play it online, so I don't know anything about i.Link IDs or any of that. I can dump the disk, but anything requiring running homebrew on the console would have to wait, I guess. Maybe you can point me in the right direction on this too. Also, I dont currently have an actual PS2 controller, but I do have a few PS1 DSs. I mention this in case an actual DS2 is needed for any of this. The disk has a small paper label slapped on top of the original Seagate one with a barcode and some numbers. Maybe the thing was sent for repair and it's a replacement disk provided by Sony's tech service? EDIT2: I connected the HDD and it seems to work. Windows' disk manager says "not initialized" so that's good. It offers me to slap an MBR on to it, to which I politely refuse, of course. I'll try dumping it and see how that goes. @radorn first of all you can check if you have HDD OSD installed (just go to Browser and you will see HDD icon). 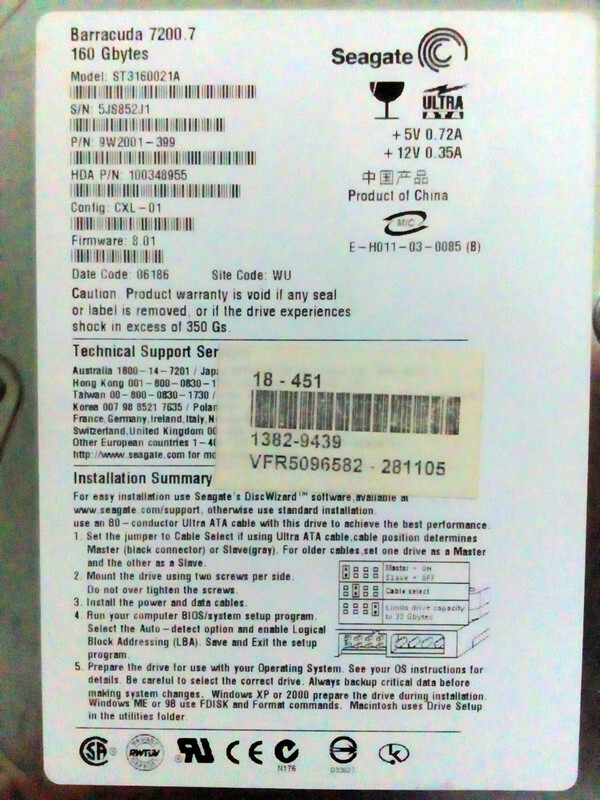 Next: you can post HDD sticker photo here. If HDD is not genuine (probably not genuine as for retail PS2 only 40Gb hdds was released) somebody will tell you about it. I don't remember for sure, but I did explore the BIOS menus quite a bit when I revised the thing and I don't think I found anything related to the HDD. I guess I can take another look and make sure. Where should that pop up if it exists? As about HDD icon you can check this video for example. @AKuHAK Oh... no, the "Browser" screen is all empty unless I plug in a memory card or disc. There was 1 LBA with a CRC error, but checking the disk throuh a hex editor that and all surrounding sectors are seem to contain just zeros, so, not much of a problem, I suppose. What can I use to check what's in there? UPDATE2: Sector 14 of the disk contains the string "HDLoader Setting"... that's for booting ISOs right? Do I assume the disk is all backups? According to all of this I can say that your HDD is not genuine. Previous owner was used it for keeping game backups in hdloader format. There is no sense for making and sharing dumps, you can remove your dump to free up space on your PC. If you will be able to launch homebrew from ps2 you can play all his backuped games from OPL, but this is a bit offtopic and is not related to this topic.